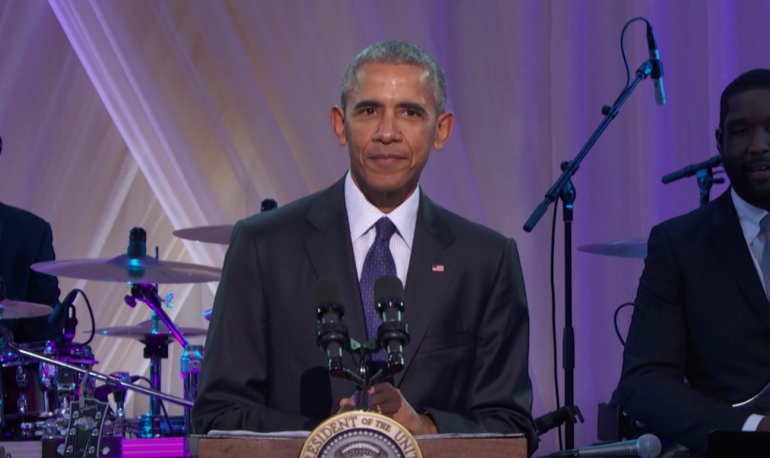 Last month the White House hosted the musical tribute “BET Presents Love & Happiness: An Obama Celebration.” The event was televised on Tuesday, November 15 on BET and served as a love letter to President Barack Obama and First Lady Michelle Obama. The celebration, which Dave Chappelle referenced in his “SNL” monologue and joked about Bradley Cooper being the only “white guy,” included performances from Jill Scott, Janelle Monaé, Common, Usher, Bell Biv DeVoe, The Roots, De La Soul, Yolanda Adams, Michelle Williams, Kierra Sheard, and “Hamilton” star Leslie Odom, Jr. He then explained the history of holding live performances at the White House and described how Chester A. Arthur opened the doors to the all-black Fisk Jubilee Singers, Theodore Roosevelt had Scott Joplin and how the Kennedys did the twist.